A simplified block diagram of ExpEYES Junior is shown in the figure. The sensor/control elements are connected to the micro-controller. 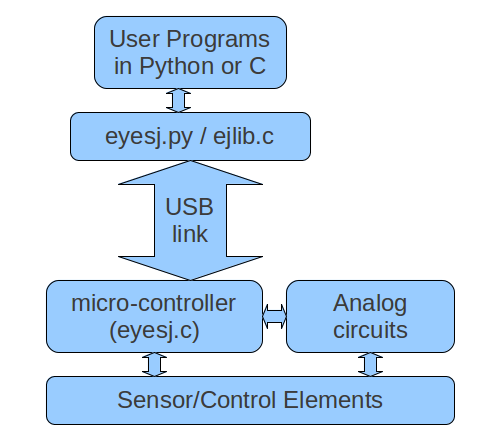 The user programs uses the Python Library to communicate to the micro-controller, running a program, written in C and Assembler. The micro-controller performs the control/measurement operations and sends the result back to the PC. The job is divided according to the capabilities and strong points of each device. The micro-controller does all the real time measurements and pass on the results to the PC where Python code is used for processing and displaying the data. The ExpEYES-17 version has been derived from the open source design released by Jithin B P. The modified version is HERE.